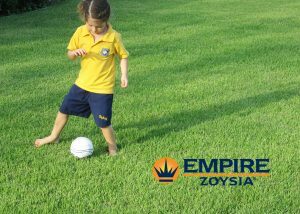 EmpireTM has a reputation for being one of the most drought tolerant, water efficient varieties available in Australia. It is a soft, easy-to-manage lawn that grows Australia-wide and features a fine leaf with strong wear tolerance, making it ideal for homes virtually anywhere from Darwin to Hobart and Sydney to Perth. Two of its prominent features include; its good, strong green colour throughout autumn and winter and its minimal maintenance year-round in terms of mowing, watering and fertilising. Both open and moderately shaded environments suit this variety, which can also withstand significant temperature drops. Because of its dense growth pattern, EmpireTM competes well against weeds and has a high pest and disease tolerance. Its deep root system also makes it suitable for erosion control.